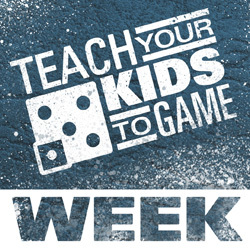 DriveThruRPG’s Teach Your Kids to Game Week Returns! OneBookShelf, Inc., the parent company of DriveThruRPG.com and DriveThruComics.com, announced today that their advocacy event “Teach Your Kids To Game Week” (rpg.drivethrustuff.com/rpg_teachkids.php) will begin on Monday, December 3rd and end on Friday, December 7th. While DriveThruRPG is the largest digital RPG distributor on the web, the retailer also advocates the positive benefits of gaming with kids. Teach Your Kids To Game Week is a program designed to reach out to the community and will feature articles, tips, and advice to do just that. During this time, DriveThruRPG will also feature a small selection of “top choices” for gaming with kids on the Teach Your Kids To Game Week page, the site will also spotlight a Family Gaming sub-category which includes: role-playing game, core books, supplements and other goodies for gaming as a family. Among the featured games for kids are Hero Kids, a new RPG by Hero Forge Games, Argyle & Crew by the folks at Troll in the Corner and OneBookShelf’s just launched free FirstFable. DriveThruRPG.com is part of the OneBookShelf family of sites that includes DriveThruFiction, DriveThruComics, RPGNow and WarGameVault. OneBookShelf has been operating e-book marketplaces for over ten years, sending millions in royalties each year to thousands of publishers and authors.